Discover imperial Beijing, and walk a picturesque stretch of the Great Wall. Marvel at the Terracotta Army in Xian, the city on the Silk Road made famous by Marco Polo. See the Pandas in Sichuan Chengdu. Save 50% on the Single Supplement price on selected departures. Please see Dates and Prices below for applicable journeys. Valid on select departures only. Single supplement discount not combinable with any other single supplement discounts including MPC and Chairman's Club. Offer is combinable with the 5% MPC and Chairman’s Club discount. Offer subject to availability and may be withdrawn at any time. Explore remarkable cultures on an intriguing journey through China. Discover imperial Beijing, and walk a picturesque stretch of the Great Wall. Marvel at the Terracotta Army in Xian, the city on the Silk Road made famous by Marco Polo. See the Pandas in Sichuan Chengdu, before travelling to magical Lhasa, one of the highest cities on earth, by altitude and spiritualty. 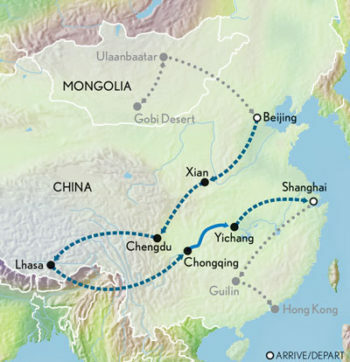 Cruise the Yangtze River through the stunning Three Gorges region, and end your journey in fabulous Shanghai. Arrive in Beijing, China’s capital and cultural hub, where you are transferred to your luxurious hotel. After a morning welcome briefing, participate in a tai chi lesson at the Temple of Heaven, a classic example of Ming architecture. After lunch, explore Tiananmen Square, and then walk in the footsteps of emperors in the Forbidden City, seat of imperial power for centuries. This evening, enjoy a welcome dinner with your fellow guests. Travel to the well-preserved Mutianyu section of the Great Wall of China. Walk or ride a cable car to the top and view the stunning mountains. Return to Beijing, where you Ride Like a Local on a pedicab through a hutong — a neighbourhood of small winding alleyways. Fly to Xian, made famous by Marco Polo. Once a vital stop on the Great Silk Road, Xian has become a melting pot of Asian and Middle Eastern influences. This afternoon, view the Great Mosque, a fascinating site blending classic Chinese temple architecture and central Asian embellishments. Visit the city’s lively Muslim Quarter with its teeming markets. View the incomparable Terra Cotta Warriors, lost to the world for two millennia until accidentally rediscovered by a farmer. Explore the army with an on-site specialist at your side. Then, enjoy a private Chef’s Table experience in dumpling-making. Later, stroll the impressive ramparts of Xian’s City Wall. Travel to Chengdu by bullet train. Visit the People’s Park, the city’s largest public park, where you immerse yourself in local life and culture, watching area residents play traditional Chinese instruments, practice calligraphy and engage in tai chi. Enjoy a tea demonstration at a local teahouse. This evening, savour local Sichuan specialties at a traditional hot pot dinner. Visit the Chengdu Panda Breeding and Research Centre and observe giant pandas roaming in their natural habitat. Then, enjoy an afternoon at leisure to relax or explore Chengdu, a city renowned for its thriving music scene and nightlife. Fly to Lhasa, the heart and soul of Tibet, one of the highest cities on earth at 12,000 feet and your home for the next three nights. Relax and acclimatize. Experience the spiritual heart of Tibet at the sacred Jokhang, a 1,300-year-old temple. Wander Lhasa’s Barkhor Bazaar, and visit the Dropenling Tibet Handicraft Development Centre. Continue to renowned Sera Monastery, and visit with a local family for firsthand insights into Tibetan culture. Discover the Dalai Lama’s former summer residence at Norbulingka, surrounded by trees, ponds, gardens and pavilions. Next, venture beyond the towering walls of the awe-inspiring Potala Palace, former winter residence of the Dalai Lama. Fly to Chongqing to board your river cruiser for a three-night journey through the Three Gorges region. Disembark in the small city of Fuling and enjoy a shore excursion, beginning with a visit to the White Crane Ridge Underwater Museum. Descend 150 feet underwater to see centuries-old rock carvings. Afterward, continue to a local market to gain insight into the region’s rich culinary culture. This afternoon, learn about Chinese traditional medicine and reflexology. Tonight, attend the Captain’s Reception. Early this morning, ‘Yangzi Explorer’ navigates the Qutang and Wu gorges before anchoring at Badong, where you board a ferry and travel up Shennong Stream. Disembark to board local “pea pod” boats poled by Tujia boatmen — members of a local minority culture famed for their river skills — and explore a scenic gorge and village. Tonight, gather for a “Taste of China” dinner experience. This morning, disembark and fly to Shanghai, stopping briefly to photograph the Three Gorges Dam. On arrival in Shanghai, transfer to your elegant hotel located on the famous Bund. Explore Shanghai, visiting Zhujiajiao, a water village evoking China’s medieval past. Cruise its main canal in a sampan (wooden boat). This evening, attend a Shanghai Acrobatic show. Stroll the Bund, Shanghai’s popular promenade. Then, wander the streets of Old Town and visit the 16th-century Yu Garden. Later, explore the M-50 Contemporary Art District, and gather for a festive farewell dinner. After breakfast, transfer to the airport for your flight home or to depart for a post-tour extension. Last group event: farewell dinner at 7:30 p.m. on Day 16.